Cabela's, online at Cabelas.com, is your destination for outdoor gear and accessories. Cabela's sells tents, fishing rods and reels, two-way radios, bait, fishing line, life jackets and vests, boat covers, boat seats, canoes, kayaks, and small boats. Cabela's also offers ATV accessories, travel trailers, batteries and chargers, binoculars, cots, and sleeping bags. You can find apparel for men, women, and children including: casual pants, jeans, sweaters, jackets, and hunting gear at Capela's as well. RetailSteal.com has the best Cabela's coupons, Cabela's discounts, and Cabela's promo codes. Shipping and handling rates at Cabela's depend on the pricing of your order and the destination for your shipping request. See website for full details, exclusions may apply. 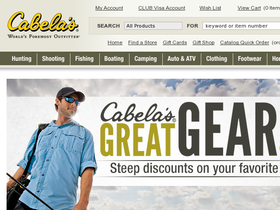 Enjoy free shipping on orders of $49 or more from Cabela's when you use this coupon code. Click to save. Check out the bargain cave online at Cabelas.com and enjoy up to 70% off a wide range of items. Shop online at Cabelas.com and enjoy up to 60% off brand name footwear. Click link to shop. Plan your family camping trip with Cabela's and save up to 50% off a huge range of camping equipment and accessories. Shop for outerwear at Cabelas.com and save up to 60% off brands including Columbia, Carhartt, The North Face, and more. Get 15% off boating trailer accessories online at Cabela's. Click link to purchase. Sign up for the Cabela's visa card and when you're approved, you'll get $20 in free gear. Click link for more info.